Attributed to Andrea Riccio (1470-1532). Andrea Riccio (c. 1470 – 1532) was an Italian sculptor and occasional architect, whose real name was Andrea Briosco, but is usually known by his sobriquet meaning "curly"; he is also known as Il Riccio and Andrea Crispus ("curly" in Latin). He is mainly known for small bronzes, often practical objects such as inkwells, door knockers or fire-dogs, exquisitely sculpted and decorated in a classicising Renaissance style. Born at Padua, and first trained as a gold­smith by his fa­ther, Am­bro­gio di Cristo­foro Briosco. 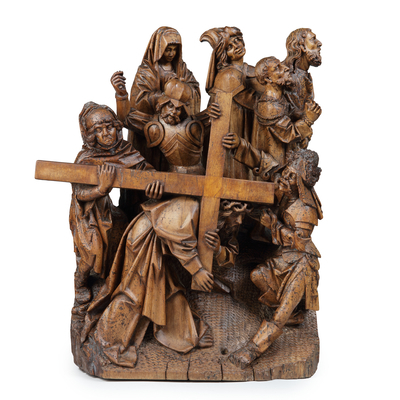 He later began to study bronze cast­ing under Bartolomeo Bellano, a pupil of Donatello. 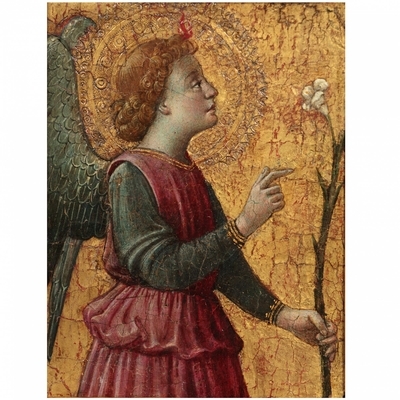 As an ar­chi­tect, he is known for the church of Santa Giustina in his na­tive city. His mas­ter­pieces are the bronze Paschal can­de­labrum in the choir in Basilica of Sant'Antonio at Padua (1515), and the two bronze re­liefs (1507) of David danc­ing be­fore the Ark and Judith and Holofernes in the same church. His bronze and mar­ble tomb of the physi­cian Girolamo della Torre in the church of San Fermo at Verona was beau­ti­fully dec­o­rated with re­liefs, which were taken away by the French and are now in the Louvre. His smaller, eas­ily trans­portable, works ap­pealed to col­lec­tors across Eu­rope. When studying bronze statuettes of the Italian Renaissance, it is imperative to stress that many of these small sculptures came to be accepted during subsequent centuries as genuine classical antiquities. To a certain extent, this confusion resulted from the conscious and nostalgic attempt on the part of Renaissance sculptors to emu late the mythological subject matter and evoke the classicizing spirit of the ancient figural bronzes of small scale then being zealously excavated in Italy. Yet the most consequential factor that sustained the erro neous belief that numerous bronze statu ettes of the Renaissance were created in an tiquity was that they had not yet been ex posed to methodical visual scrutiny to de termine their actual date of origin. Indeed, it was not until the second half of the nine teenth century and continuing through the early decades of this century that pioneering scholars began to segregate the Renaissance bronzes form the ancient bronzes in the leading European museums and princely collections, thereby effectively inaugurating modern study in this field. Still, it remains fascinating, instructive, and even amusing to trace the checkered history of one of these Renaissance bronzes from the time it was firstaccepted as a classical antiquity to the realization that it dates to a later epoch. 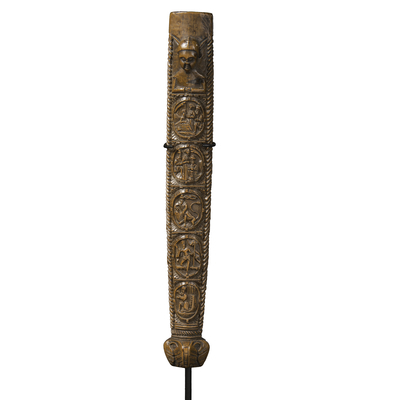 With this purpose in mind, we can spot light the ingeniously conceived bronze oil lamp that assumes the form of a pleasingly bizarre and ribald acrobat illustrated in Figure I. While lacking an exact classical antecedent but unquestionably of stellar quality, it can be convincingly attributed to the eminent Paduan bronze sculptor Andrea Riccio (1470-1532). 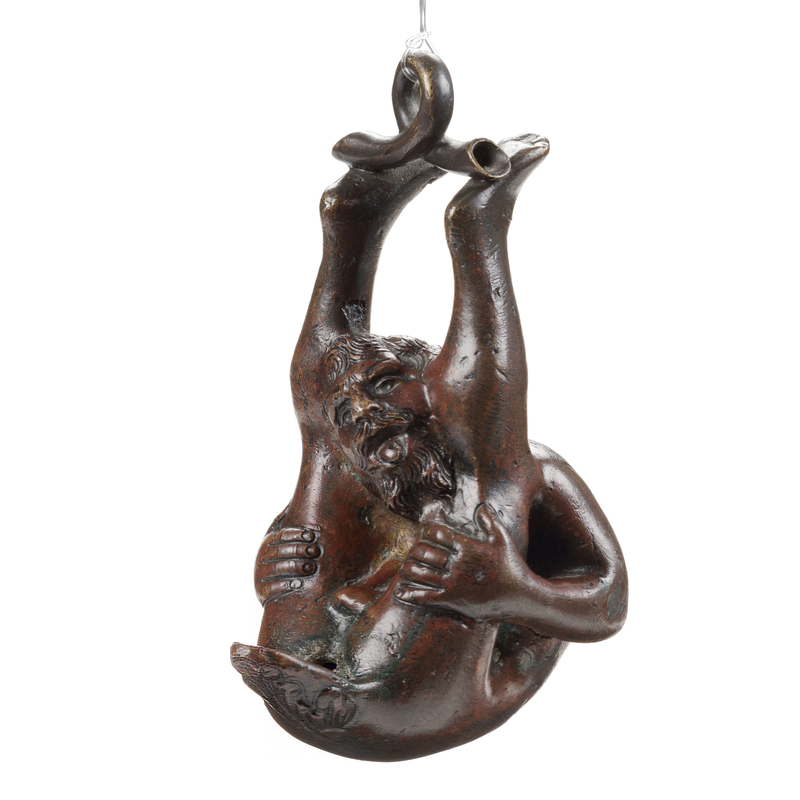 This contortionist displays all of the stylistic hallmarks of Riccio's hand, including the swollen satyr like face with lecherous sneer, open mouth, and wide-bridged nose as well as the thick, curly hair, the heavily knuckled and square shaped fingers, and the smooth back. The meticulous hammering, filing, and overall sparkling surface effects are also technical features characteristic of this master's working method. Of the approximately twenty existing versions of this contortionist bronze that we have located thus far, only one other example of remarkably high merit, in a private collection in Basel, is likewise worthy of being considered an autograph work of Riccio himself, as initially established by Planiscig.